Since the Discovery Center launched as a Beta initiative last year, we’ve been observing an exponential increase in visitors and hearing our customer base asking for more learning opportunities. The team has been paying close attention to this great user feedback (thank you!) and we’ve been focused on making enhancements to suit user needs. So, we are very excited to introduce the new and improved Discovery Center – redesigned to make it easy to find and use the extensive learning content. For those of you who don’t know, the Discovery Center is Corel’s learning website – or, as we like to think of it, your home for creative learning. The goal of the Discovery Center is simple: to help people pursue their creative interests. We know that there are two sides to any artistic project, the creative idea and the technical know-how. The Discovery Center therefore aims to inspire and to educate. Think of us as a forum for aspiring enthusiasts to learn new skills and get new ideas in their own way and at their own pace. 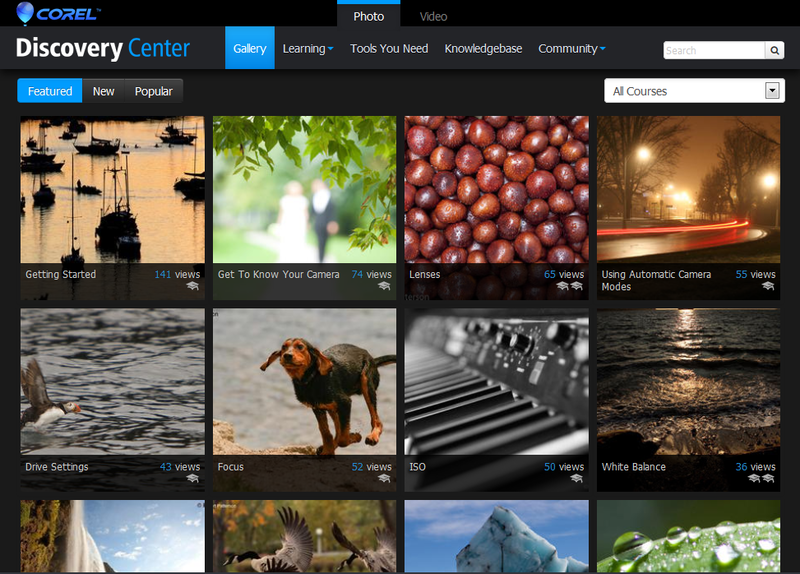 Today the Discovery Center is launching with new photography, photo editing and video editing learning content. It offers all the tools you need to learn how to take beautiful pictures, or turn your video footage into a true masterpiece. The site includes a wide variety of creative and instructional content designed to cater to every personality and learning style. You will find new inspiration while browsing galleries of stunning digital artwork from around the world. You can learn at your own pace with structured courses made up of easy-to-follow video tutorials, or enhance your training offline with a variety of detailed written tutorials and eBooks. Plus, you have access to personalized one-on-one instruction from the experts. We want you to learn the way you want, when you want! We invite you to visit the new Discovery Center and keep checking in as we continue to produce more content and expand this new experience to cover graphics and digital art. My name is Annie and I am the Discovery Center team leader at Corel. I am a McGill University graduate with a background in political sciences. In my spare time I love to travel, swim, ski and read a lot! This entry was posted in Photo, Video and tagged Corel, Discovery Center, Learning, Photo, Photography Tutorials, Tutorials, Video. Bookmark the permalink. The new Discovery Center is wonderfull. But I am waiting to see Graphics (CorelDRAW and CorelPHOTOPAINT), TechGraphics (CorelDESIGNER) section in Discovery Center. Thank you very much for your feedback! Stay tuned – we will be adding the graphics and digital art sections to the new Discovery Center soon.